Mary Ann was born in Jasper, Indiana, on September 6, 1932, to Theodore and Alvina (Rees) Beck. She married Andrew J. Vogler on April 30, 1953, in St. Joseph's Catholic Church in Jasper, Indiana. He preceded her in death on December 2, 2014. Mary Ann worked in electronics at Kimball for 25 years. Mary Ann was a member of St. Joseph's Catholic church in Jasper, the St. Ann's Society, and the V.F.W. Auxiliary. 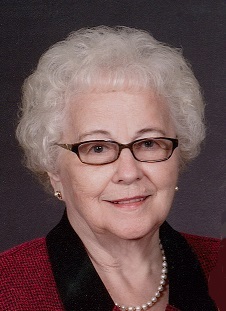 She enjoyed quilting, gardening, traveling, and spending time with her grandchildren. Surviving are three daughters, Diane (Glenn) Friedman, Santa Claus, IN, Victoria (Michael) Merkel, Jasper, IN, Bonita (Frederick) Blessinger, Kokomo, IN, two sons, Stephen (Kathleen) Vogler, Jasper, IN, Rick (Cindy) Vogler, Haysville, IN, 13 grandchildren, 12 great grandchildren, and two great great grandchildren. Preceding her in death besides her husband are one grandson, Nathan Merkel, one sister, Victoria Beck, who died in infancy, and three brothers, Herb, Maurice, and Arnie Beck. A Mass of Christian Burial for Mary Ann Vogler will be held at 9:30 a.m. on Tuesday, December 4, 2018, at St. Joseph's Catholic Church in Jasper, with entombment to follow in the Fairview Cemetery Mausoleum in Jasper. A visitation will be held from 2:00 p.m. until 8:00 p.m. on Monday, December 3, 2018 at the Becher-Kluesner Downtown Chapel in Jasper, IN. The St. Ann's Society will pray the rosary at 1:45 p.m.
Memorial contributions may be made to St. Joseph's Catholic Church, Heart to Heart Hospice, or to a favorite charity.